Summertime is all about salad–cold, make-ahead, no fuss food. Which is why quinoa has become one of my fav’s. 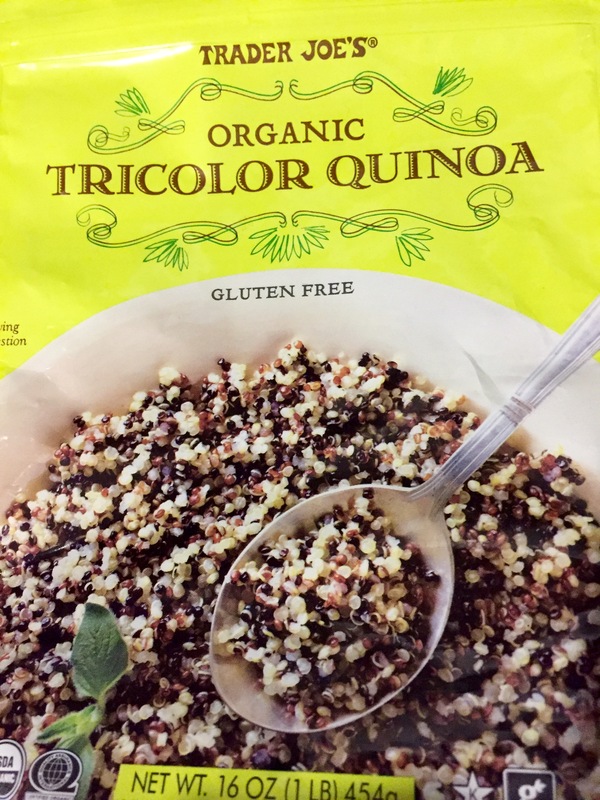 Quinoa is a grain and contains protein, making it crazy healthy. And it’s so versatile that it can be a side dish, a salad base, a salad topping, or an ingredient in another dish altogether. The first few times I tried it, it hurt my tummy; and then I discovered that rinsing it in cold water before boiling makes it easier to digest. My favorite brand, of course, comes from Trader Joe’s. The three colors don’t change the flavor but they do make it more visually interesting. Friends shared both of these recipes with me, and they have quickly become go-to happy family recipes that I am pleased to share with you! First, prepare the quinoa. In a fine-mesh strainer, rinse 1 cup quinoa in cold water. Add to pot with 2 cups boiling water. Cover and reduce heat, then simmer for 10 to 15 minutes until the quinoa develops ‘tails’–you’ll know ’em when you see ’em. 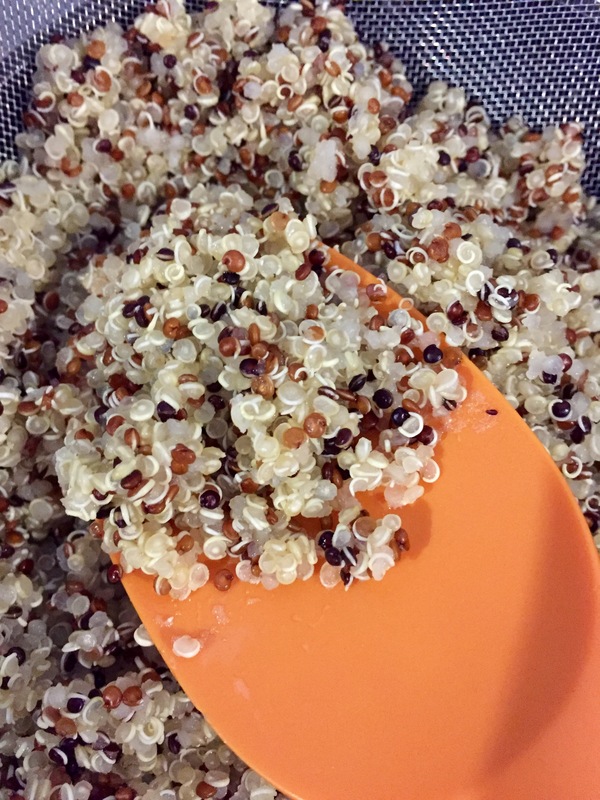 Drain any excess water and rinse quinoa again to cool. Set aside. Can you see the ‘tails’? While quinoa cooks, whisk oil, lemon juice, garlic and 21 Gun in a large bowl. Add other ingredients, including cooked quinoa. Chill for at least 30 minutes. 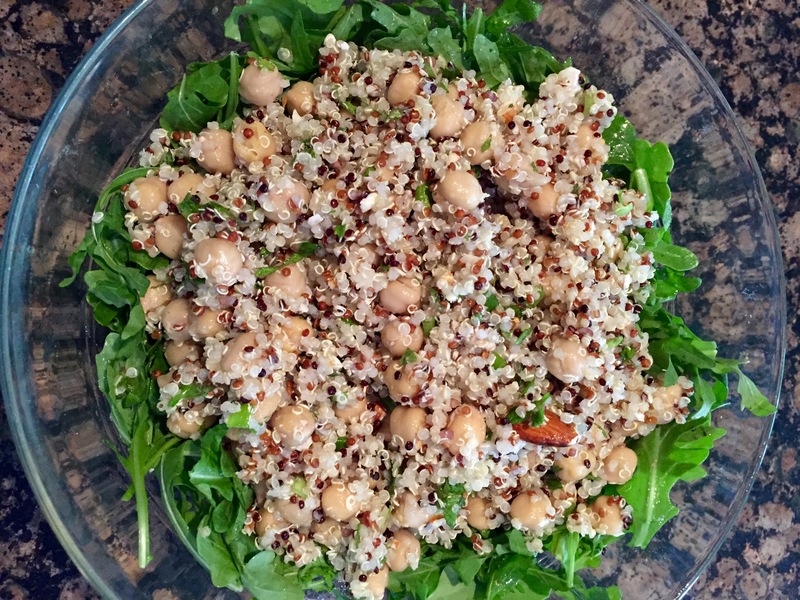 Note: I made a little more vinaigrette and lightly dressed some arugula, then served quinoa on top. I can also imagine this would be fantastic in whole wheat pita bread with hummus (Trader Joe’s Mediterranean hummus is our go-to). While quinoa cooks, whisk oil, lime juice, garlic and spices in a large bowl. Add other ingredients, including cooked quinoa. Chill for at least 30 minutes. 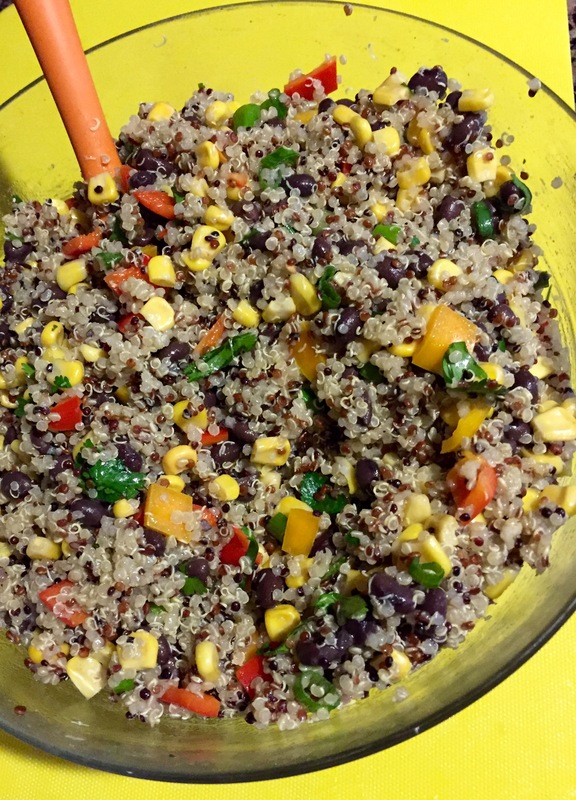 This entry was posted in cooking, Uncategorized and tagged quinoa, salad, summer, Trader Joe's by Milagro Mama. Bookmark the permalink.